يشكل كويست سيرفيسد أبارتمنتس كرايست تشرش بموقعه الممتاز في المدينة نقطة انطلاق جيدة لاستكشاف أفضل ما فيها من معالم ومناطق نابضة بالحياة. يقع مركز المدينة على بعد 0.05km فقط. ويمكن الوصول إلى المطار خلال 25 دقيقة. يوفر العقار بفضل موقعة الجيد وصولاً سهلاً إلى أهم معالم المدينة.
. يقدم كويست سيرفيسد أبارتمنتس كرايست تشرش خدمات لا غبار عليها وكل أشكال اللياقة وحسن الضيافة اللازمة لإسعاد ضيوفه. يقدم العقار خدمة غسيل ذاتية, واي فاي مجاني في جميع الغرف, تخزين الأمتعة, واي فاي في المناطق العامة, صف السيارات لضمان الراحة القصوى لضيوفه. يمكن للنزلاء الاختيار من ضمن مجموعة من الغرف المصممة بعناية لتعكس جواً من الراحة، والتي يتجاوز عددها 72. كما أن مجموعة الخدمات الواسعة الموجودة في الفندق لضمان راحتك تترك لك الكثير من الخيارات لقضاء وقتك أثناء فترة إقامتك. إن كويست سيرفيسد أبارتمنتس كرايست تشرش هو خيار ذكي بالنسبة للمسافرين، فهو يوفر إقامة هادئة ومناسبة للاسترخاء. لا يوجد خدمة مواصلات المطار في هذا العقار. Good location and reasonable price. The room is more spacious than we expected (most of the hotel rooms are so small now). Staff was helpful. The stay was pleasant except the neighbour was a bit noisy on our first night. The doors are heavy so we could hear their ins and outs and talking. The hotel is just 10 mins away from the central bus / coach station. It is just 2 mins from the old cathedral and 8 mins from new cardboard cathedral. Location is good. Hotel is clean and everything is alright except the the room only save less than 30mins hot water. So, it is quite fast running out of hot water. The is the main drawback of our stay. Our party of 5 adults stayed here on our last night in New Zealand. We had a 2 bed apartment with a further bed in the lounge. We found the apartment central and were able to walk around the city from here. We did not use the cooking facilities (except toaster), preferring to eat out at one of the many local restaurants. The hotel allowed us a slightly later checkout, which allowed us to use the room longer on the morning of our departure. 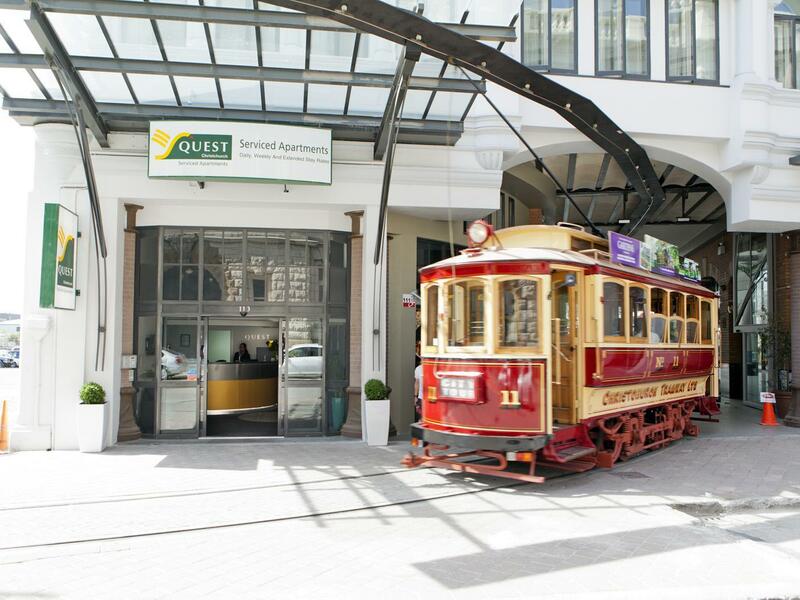 I would use this hotel again if we return to Christchurch. great location within walking distance to everything! Tram stop right outside the door. Tram is well worth taking to see an overview of the city and can get on and off as many times as you like. Can walk to cafes round the corner in quaint trendy street. 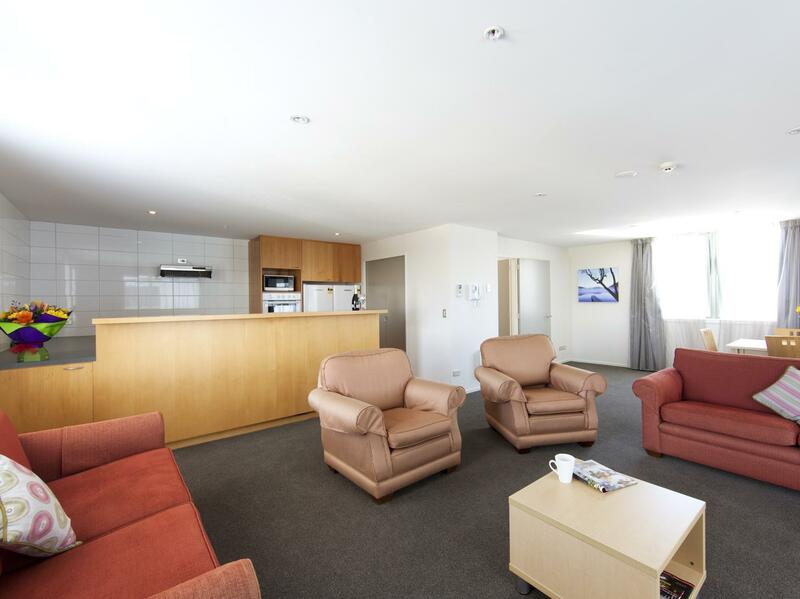 Close to Avon River area and shopping precinct. Room average size and facilities. Very secure building and area. For drivers using GPS, it took us awhile to actually arrive at the hotel due to the various road closures due to the earthquake. 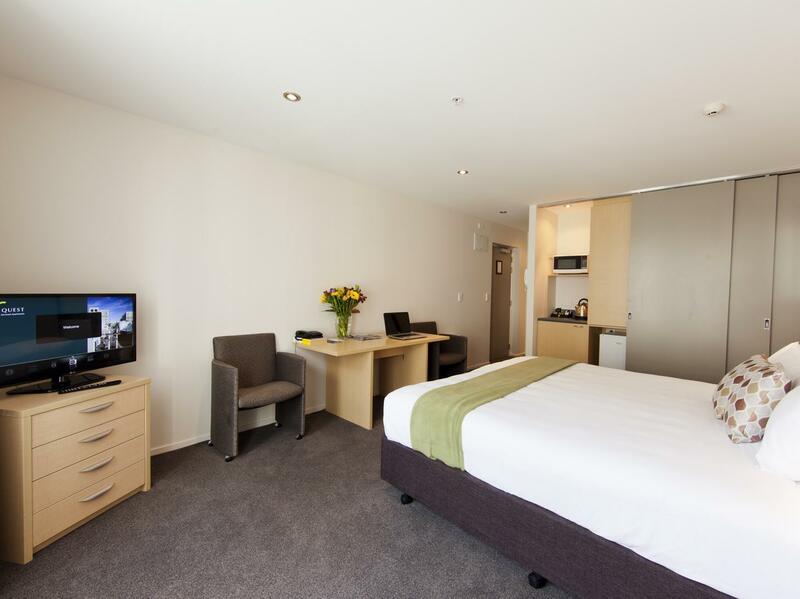 However, upon arrival, it is definitely one of the most well located hotels, making it within walking distance from major attractions in Christchurch. The rooms are decently sized for my wife and I. Overall a good stay. Right at the Junction, the tram starting point. Get combined ticket for $86 for tram circuit on and off, punting on the Avon, botatinical gardens tour plus gondola ride with return bus trip. Good Chinese restaurant upstairs at the Junction. Very comfortable and good sized rooms in the annexe, part of Quest. Very helpful staff. The place was very nice and big. Rooms were provided with all the necessaries. And the staff were pleasant too. There are lots of food options available nearby and conveniently located. Everything was superb. I will definitely recommend and come back back here again It was really a pleasant stay. Helpful friendly staff, good location, large clean rooms, secure parking, good price. We will stay again. Just one thing though. We stayed in the West Tower and the lift looked and felt grimy. I would suggest that a good amount of time is spent giving the lift a deep clean as it is rather of putting when you get in it. This was my partners first experience of the apartments and she was a little apprehensive about the state of the rest of the building. We stayed in a one bedroom apartment which was spacious and clean. There is however no air conditioning in the apartment. The tram station is just around the corner and there are lots of eateries nearby. Well located in the middle of town. Good sized rooms. Lack of mini bar. Good for longer term stays especially if you get a kitchen in your room (the quality of kitchens is variable). Good all round choice. Located just next to many tourist attraction. The room is very clean, spotless, clean bedsheets, complete with microwave, plates, cuttlery, fan, ironing board, fridge. 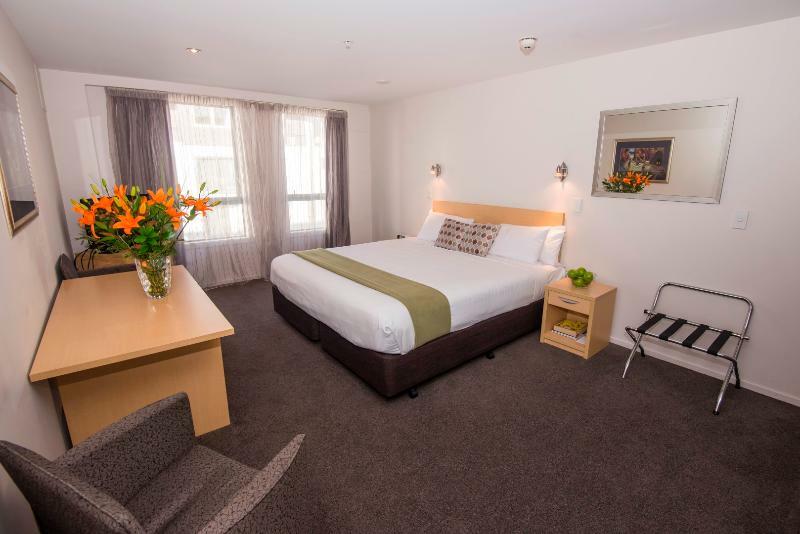 Free wifi internet for 1hour only or extra charge $5 for another hour or $12 for a day.Hotel located in prime location just next to Chatedral juction, tram stop, information center and just 3min walk to christchurch cathedral or you can use a tram. If you like to hang arround and enjoy the city you also can visit Cardboard church, Avon river, christchurch museum and botanic garden. Overall its highly recommended hotel with clean room, good lighting, whole room very bright and the hall way all using sensoring light its very bright and clean. Satisfied with the location, cleanliness, and safety of the rooms. Equipment was complete and in good working order. Staff were friendly and helpful. The tram station next to the apartment tower was additional value. Nice large apartment. Only negative is the tv could be bigger. The staff were friendly and helpful. Everything was walking distance. 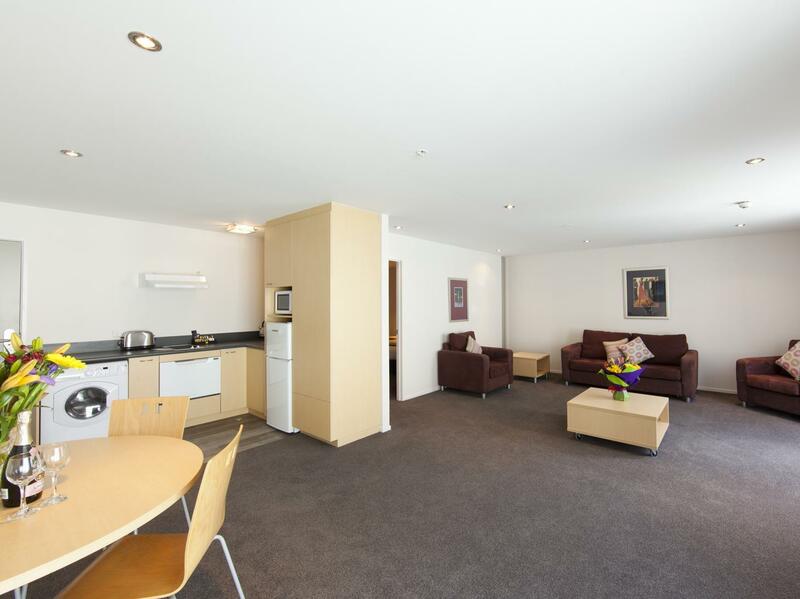 Excellent location and very central in Christchurch.